There’s so much great stuff to do in Durango’s great outdoors, it can be difficult to stay indoors — but it doesn’t have to be. The Quality Inn in Durango is one block from the Durango Community Recreation Center, which is open daily and offers adults, kids and the young-at-heart plenty to do in case the weather outside is too hot or too cold or too rainy or too windy to enjoy the myriad of outdoor recreation options Durango has to offer. Or, hey, maybe you just don’t think the great outdoors are that great, and that’s OK, too. The 71,500-square-foot recreation center has a lap pool, hot tub and leisure pool, which is sort of like Durango’s version of a waterpark. 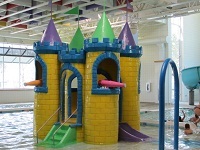 The leisure pool offers diving boards, a 160-foot water slide and a lazy river as well as a kiddie play area with a teeter-totter, spraying clam and a castle surrounded by a moat (er, in the middle of the wading pool) complete with water cannons to fend off invaders. Confront your fear of heights on the climbing wall. 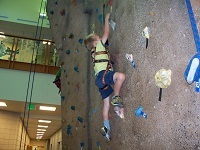 Or you can tackle the 30-foot climbing wall at the rec center, where staff are on hand to help with harnesses, provide a belay and shout encouragement as you climb to the top. Of course the recreation center also offers the traditional fitness favorites such as aerobics classes, an indoor track, free weights and cardio equipment. There’s also racquetball courts and a two-court gymnasium with maple wood floors for games of basketball, volleyball or dodgeball. If you find yourself with some extra time in Durango and are looking for a place to take the family — or a place to unwind by yourself — the Durango Community Recreation Center has it all. Book your room at the Durango Quality Inn today and walk to the rec center tonight (or tomorrow or whenever you’re here; you get the idea).